More than one in ten (9.2%) of all Europe’s wild bee species are facing extinction due to modern farming practices and climate change, which have reduced the number of flowers considerably over recent decades, according to a new assessment published on Thursday. The assessment, part of the Status and Trends of European Pollinators (STEP) project and The IUCN European Red List of Bees, both funded by the European Commission, warns that 5.2% of all European wild bee species are at serious risk of extinction ‘in the near future’. The authors add that what will become of 56.7% of all the continent’s bee species is unknown because of insufficient data. The two reports provide the most thorough study to date on Europe’s 1,965 bee species, including their population trends, status, distribution and threats. However, the authors stress that there is still a great deal we do not know about bees’ status and outlook, and that further large-scale monitoring in required. The studies inform that 7.7% of species’ populations are falling, 12.6% are steady, while 0.7% are rising. For the remaining 79% there is not enough data to determine. The authors point to intensive farming and agricultural practices as the main threats to bees’ survival. Intensive silage production, for example, at the expense of hay cropping, has led to losses of grasslands which are rich in herbs and season-long flowering. Bees have historically relied on these important sources of forage. Fertilizer use promotes rank grassland, which is low in flowering plants and legume species. Today, this has become the preferred food resource for several bee species. The surface area of dry steppes has declined because of farming practices and intensive agriculture. Andrena transitoria, an eastern Mediterranean bee species that was common from Sicily to Ukraine, has seen its population decimated as a result. Ploughing, mowing and grazing of flowering plants, combined with the use of insecticides have caused the population of Andrena transitoria to plummet by 30% over the past decade. In several European nations the species has become extinct. Climate change is detrimentally affecting bee populations across Europe, with the bumblebee suffering the most. Prolonged droughts, heat waves and higher temperatures, as well as abnormally heavy downpours have contributed towards altering bees’ habitats, which in turn have led to their declining populations. The authors inform that 25.8% of Europe’s bumblebee species run a serious risk of extinction. Several wild be populations have been affected by urban development and a higher incidence and greater intensity of fires. Regarding the Western Honeybee (Apis mellifera), Europe’s best-known pollinator, status and outlook has been impossible to determine because nobody yet knows how much of its population consists of wild versus domesticated bees. Scientists have classed the Western Honeybee as Data Deficient, given that the report focused only on wild species. 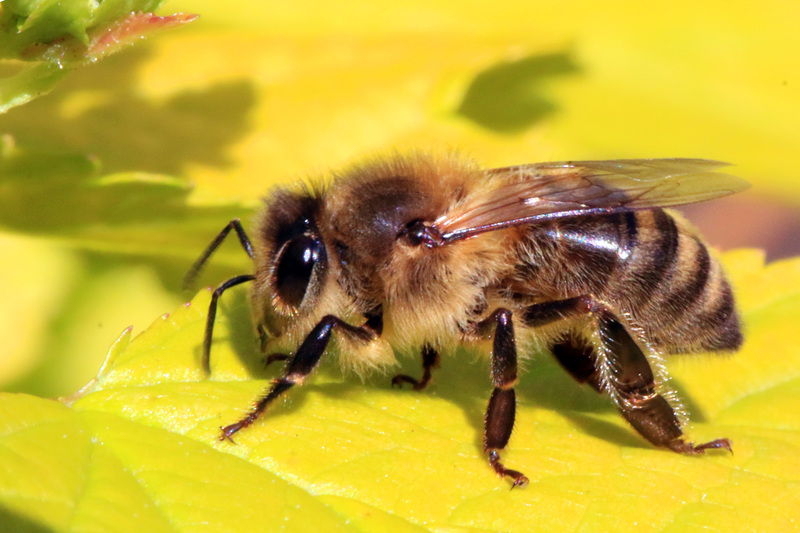 The authors say further research is required to determine what the wild versus domesticated ratio is for Apis mellifera. The authors are calling on European policymakers to take bee conservation more seriously and urgently. They need to focus more on the management of protected areas as well as European agricultural policies. Survey programs at European and national levels should be supported more enthusiastically, as should bee taxonomists (scientists who group organisms into categories), in order to ensure that the status of bees is done properly and conservation measures are carried out effectively. Our ecosystems, agriculture and the economy need bees. Just their pollination of crops is estimated to be worth €153 billion each year globally (€22 billion in Europe). “Pollinators support crops accounting for 35% of global agricultural production volumes,” says the report. Eighty-four percent of all agricultural (non-livestock) produce we consume require insect pollination to improve quality and yields. Examples of insect pollinators include hoverflies, solitary bees, honeybees, bumblebees, moths, beetles and butterflies. British hedgerows have more flowers on their road-facing side than their crop-facing side, researchers at Plymouth University reported last week. With poor pickings on the crop-facing side, bumblebees today have no choice but to spend considerably more time on the road-facing side. This is a consequence of increased pesticide and fertilizer usage in agriculture. There is, however, a simple solution, the scientists say. If farmers could be encouraged to leave a wider barrier between the edge of their crops and hedgerows, wildflowers on the crop-facing side might flourish again. The number of flowers in the British landscape have plunged, the Bumblebee Conservation Trust says, leaving bees with a much-reduced food supply. Over the last 75 years, two species of bumblebees have become extinct in Britain, while the surviving ones face an uncertain future.